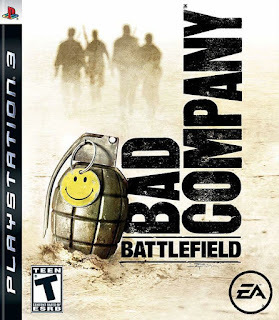 JD's Gaming Blog: The Past and Times of Yore - Battlefield Bad Company, who needs multiplayer? The Past and Times of Yore - Battlefield Bad Company, who needs multiplayer? For a long time I was only slightly aware of this game, I mean, I knew there was a bunch of games between Battlefield 2 and Battlefield: Bad Company 2 but I didn’t really care that much, I of course knew about Battlefield 2142 but I think around this time I was more occupied with World of Warcraft than anything else and the period between those two battlefield games just slipped away. Of course, there were more - Battlefield Heroes with it's cartoony graphics and third-person perspective, Battlefield 1943 which was a sort of console-lite version of BF1942, and Battlefield Play4Free which was a PC-lite version of Battlefield 2. When my housemate first mentioned Battlefield: Bad Company to me I was confused, why had I not seen or heard this before? Then I remembered why I had gone straight to Bad Company 2 before playing 1, it was on console. Now normally I would not play any FPS (With the possible exception of Timesplitters and Goldeneye) on a console, but when the PlayStation 3 version of the game was given to me as a birthday present from my housemate I had to (or was forced rather) to do the right thing and sally forth into awkward thumbstick aiming yet again which I thought I had finally gotten out of after finishing Mercenaries. I had previously played Bad Company 2 both the singleplayer and multiplayer and had found the singleplayer enjoyable enough though I was told that the story, humour and squad interaction in the first Bad Company was much better. The story begins when you are brought from a helicopter to the front lines, you play as Preston Marlowe who is a recent transfer and you soon find that Bad Company is much less formal then other military units being made up of troublemakers loose cannons from the rest of the army. Your squad consists of four soldiers Segeant Samuel Redford a battle hardened straight talking veteran who is about to retire, George Haggard a crazy demolitions expert who is the mad dog of the squad and Terrence Sweetwater, the snivelling nerdy one of the bunch who has a crush on the female dispatch officer Mike-One-Juliet who gives the orders to Redford. The action is located mostly in the fictional country of Serdaristan somewhere in eastern Europe though it is near Russia as you sometimes cross the border. Your enemies are at different times the Russian Army, the Middle Eastern Coalition and the Legionnaire Mercenaries. You start off all law-abiding and accepting of the military command’s instructions but after a while of playing the squad gets more and more rebellious eventually going AWOL to seek out the Legionnaire’s gold. Searching for gold becomes a feature of the game as you can find gold crates spread around the levels which act as a minor objective, another minor objective I found is that whenever you find a new weapon, it gets added to your ‘weapon library’ so you can collect them all. The story has a rather lighthearted feel despite the fact that you are killing people and blowing things up throughout most of the missions with Sweetwater and Haggard bantering and arguing with each other and playing rock-paper-scissors while Redford speaks on the radio, my housemate was certainly right in the fact that this was almost the opposite of Bad Company 2 where there was the same characters but they were much less juvenile in that iteration. I almost found the story a bit too comical as not only was your squad mostly a bunch of jokers and one of the only other characters you meet the President ofSedaristan had a humerous and nonchalant way about him and the whole story arc when you invade the country and romp across his golf course with the whole squad in a golf buggy eventually kidnapping him with his own chopper is pretty ridiculous. The only other character you see is the Legionnaire leader so apart from your squad that’s not much. But then again it was also fun and I guess this is what the game is meant to be, a military shooter with a humerous undertone and I’ll admit it was a lot funnier than the relative seriousness of Bad Company 2. So now we get onto the gameplay and of course yes I’m always going to moan about playing an FPS on a console but it wasn’t bad I must admit, felt even better then Mercenaries though that was 3rd person of course. You could move around look, duck, jump etc as usual (but not prone) but if was the raw ferocity of the weapons that caught me the most off guard, they just looked so big on the screen and seemed really powerful and sounded great and you really felt it when you shot someone. Another big thing that was present in the game compared to Bad Company 2 was the freedom. Even when you were with your squad they just followed you most of the time. Some objectives were basically ”go to this point on the map” but to get there you could use any means possible, huff it on foot then find a town and steal a truck, drive to the water’s edge then commandeer a boat, stop the boat to infiltrate a random enemy base and steal a chopper then crash it into the objective. It was all doable, you could traverse the mission in almost any way you wanted to unlike the singleplayer campaigns in the latter games which felt very linear indeed. I enjoyed using different secondary weapons like the Bad Company iteration of the repair tool which I always liked compared to the blowtorch of Battlefield 4 and the rocket launchers which were also very satisfying to use. I even tried sniping at certain points which worked ok though it’s obviously hard to fine aim with it. The game had an interesting way of healing, instead of regenerating health, being healed by the medic or finding medkits you healed yourself with an autoinjector which led to a lot of running around shooting then stabbing yourself, then shooting then stabbing yourself again. I didn’t have too much trouble playing the game and using the controller it was pretty simple though I did play it on easy with the reason being that I was playing it on console, I enjoyed collecting the weapons and finding the gold and there’s just something fulfilling about completing an FPS storyline, I think it’s because unlike multiplayer you’re constantly getting kills and winning. Driving vehicles was fun though a bit different from what I am used to as you are using a controller and when you enter your vehicle your entire squad gets in and man any weapons available which is pretty cool, I found the tanks and helicopters ok to fly too though a bit awkward to aim. The graphics for Bad Company were ok, they have a real rough gritty console look to them which could just be my TV but I must remember the was the first battlefield game on that particular generation of consoles but it looked fine, I especially liked the mission where you had crashed your chopper and woke up alone and had to sneak around in the dank moonlight to try and find your squadmates. The sun and sunset effects were good as well and of course the environment destruction although something we take for granted now it was certainly the thing back in this game it was just an adequately detailed military shooter for the time. I enjoyed the music which had a upbeat feel to it rather than serious all the damn time like the other single player BF games, the voice acting was great with the playful banter and all the arguing and the gunshots and explosions were all up to scratch. Hooray for Destructive environments! now they have nowhere to hide. I’ll admit I had fun playing the game though in the end I was glad to get it over with, it was a nice little story that is a demonstration that not every game has to be so linear in its level design or objectives or battle sequence and it doesn’t always have to be so damn serious too. It’s good when a game can laugh at itself just like you do. This was probably one of the best console shooters I have played though that’s not saying much cause I haven’t played many, ah well. As a side note I wasn’t able to experience the multiplayer as the game came out in 2008 so I wasn’t really able to find anyone to play with, would have been fun but meh I had really missed the time that this game was active with players, and I think that was the time I had stopped playing Battlefield 2 shortly after discovering WoW, when the dark ages started hah not really though it wasn’t until Bad Company 2 that I got onto the Battlefield again. Characters are funny but can get annoying. I think this is a good introduction to the game :D Thanks to TheRussionBadger for this compilation, and thanks DasUberpoop for his excellent Campaign gameplay. Truckasaurus Rex here I come!